Ooooh. Sayumi? Really? That's gonna be interesting if Sayumi goes all out on her cuteness act and get scolded by Sanma. Would have loved to see/hear Ai-chan on any show her own though for once.. Ya know I don't remember Ai and Sayumi interacting one on one too much! I guess this could be a good time to see how they react to each other! that's good for ai-chan really. u know, i'd always had this feeling that ai-chan doesn't really interact with other members other than Risa-chan. not that she doesn't get along with the other girls, just becuz she doesn't seem like the talkative type. and, at least from what i see, she doesn't have a lot to talk about with the other members, she mostly hangs out Gaki-san on a personal level. but now that she is leader, i hope this will change. I believe that Ai-chan loves MoMusu and the girls, and that she cares for them, it's just she probably doesn't interact with them that much. ...but this is only from what i see in videos and stuff, my own personal view. hope i might be wrong. i would like to know what u guys think of this. just one question..how many pb's does ai-chan have? Then she was also in the 5th gen photobook (which is the cutest thing EVER). u know, i'd always had this feeling that ai-chan doesn't really interact with other members other than Risa-chan. She's actually pretty close with everyone in the group. When it comes to interaction, I could go way back, but I'll just mention the current member she's supposedly least close with: Reina. I'm excluding Mitsui of course. I think Ai-chan is actually pretty talkative when she wants to be. I think Ai's pretty talkative, but on video she gets rather nervous, yeah? 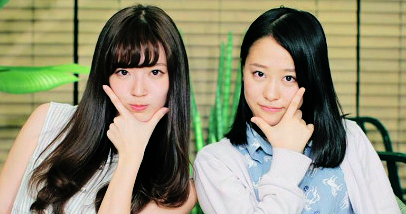 When she subbed for Miki and Rika's radioshows, she did a lot of talking, and it was all pretty interesting, too! There was no shy!Ai to be found there. Unfortunately, she's usually overshadowed by more boisterous characters, like on Young Town Douyoubi where Sanma-san does most of the talking and Ai get like...3 lines. I think this was mentioned before, where when it comes to maturity level between Ai and Risa, Risa's the more mature one and Ai plays with her juniors a lot, so I should think she's rather close with the members. I can´t say that Ai is very close friend to all the members but all the girls are partners and almost live together so they knows each other at least a little bit... Anyway Ai-chan can´t shut up when she is with Risa XDD i guess if she relax more in front of the cameras then all is gonna be ok.
thanks..do you know where I can get those? Here or here (search "takahashi ai" with quote marks, photos & collectibles), for starters. Naturally dedicated to the ever so lovely miss Takahashi. My summer vacation is approaching so I might fiiinally get some stuff on the site updated. First priority is probably getting the image gallery and other files up to speed. And a bunch of outdated info. And, and, and... Arr. Here's hoping I get to it. I'm planning to, anyway. hehe great to know you reached your 2000 th post on this thread as well~!!!! I have to admit now, I'm an Ai fan as well. After seeing her in Ribbon no Kishi and in her Alo!Hello, I've almost fallen in love with her. Well, what are you waiting for? It's just Love-Hello left! Grats on the 2000th post, definitely a good one Stryfe! And seems you just past 5000 Streak! Grats to you as well! but I want another PB from Ai already~!!! Hehe I wonder how the reaction will be though, I mean with her hair shorter I'd like to see a PB thats got a good balance of kawaii overload and incrediblely gorgeous. After all a good PB is able to capture the character of the model as well as their physical traits...and what is ai but not a bundle of kawaii hotness that you want to hug sometimes!